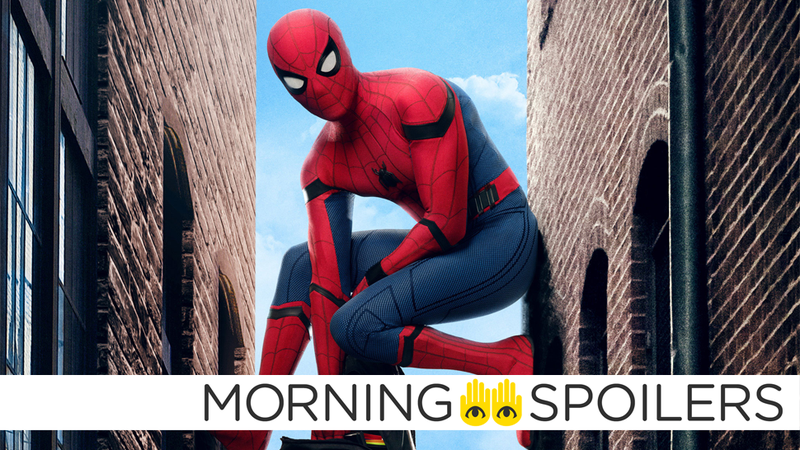 Morning Spoilers: Has Spider-Man: Far From Home Cast a Villain? What’s that in the bag, Peter? More casting news for your sequel? Kevin Feige promises the end of the MCU as we know it in Avengers 4. The Walking Dead’s incoming showrunner says the next season will see female characters step up. Plus, our first look at Shazam!’s kid-version of Billy Batson, some timey-wimey Flash set photos, and a new look at Nic Cage’s cult movie Mandy. Spoilers get! Following recent comments from Christopher Lloyd, Robert Zemeckis definitively stated, “There will not be any more Back to the Future” in an interview with the Italian outlet, Bad Taste. Omega Underground reports Star Trek 4 is rumored to begin filming this January in the U.K. and Atlanta, Georgia. During a recent interview with the Toronto Sun, Kevin Feige revealed Avengers 4 will serve as a “definitive ending” for the MCU as we know it. But, storylines can come to an end. The best stories do come to an end. Return of the Jedi was an ending for a long time and as a 10-year-old in 1983 that carried me through 30 years until there was a sequel. That hasn’t happened before in the superhero genre. A new actor comes in and a new storyline starts right away. We wanted to do it this way because we think that the best stories have a definitive ending to a storyline. That’s certainly what’s going to happen next year with Avengers 4. Elsewhere, Tom Holland stated Benedict Cumberbatch had several “difficult lines” pertaining to the Quantum Realm in a new interview with Emergency Awesome. He has the most difficult lines though. He has to talk about so much Quantum Realm stuff. I just have to talk about, ‘Yeah, man, that’s awesome!’ So mine is easy but his is so difficult! Shazam is here to chew bubble gum and check his Instagram on the latest issue of Entertainment Weekly. The issue also contains our first look at Asher Angel as Billy Batson in non Shazam-form (he’s on the left). An official Den of Geek magazine from San Diego Comic-Con reveals Ocean Master’s spectacular, finny helmet. James McAvoy returns as the Beast in a quick teaser for Glass. The full trailer arrives this Friday. A new featurette teases all five of the film’s major set pieces. Bloody-Disgusting reports the Soska Sisters’ remake of David Croenenberg’s Rabid is now filming in Canada. Bloody-Disgusting also has several new images from the unhinged-looking Mandy, in which Nicholas Cage takes on a cult in the early 1980s. More at the link. That Hashtag Show has breakdowns for five new characters named Jaco, Pax, Butterfly, Professor L, and Agent Damon. The first is a character referred to as JACO. A male in his 30s, with an open ethnicity, and a height of 6’4″ or taller, JACO is described as a silent mercenary who has both brains and brawn, who sounds hyper-intelligent when he speaks. Sounds like a combination of Ward and Fitz if you ask us. Next up is PAX, a younger male in his 20s, who is a dangerous mercenary like JACO but has a humorous streak to him. Think everyone’s favorite Lance Hunter. Since his departure, his brand of humor has been sorely missing from the team dynamic. PAX could be his replacement. BUTTERFLY is the third addition, a female in her 20s, described as unpredictable, aloof, spacey, but nonetheless lethal. Like JACO and PAX, BUTTERFLY is slated to be a recurring guest star throughout the season. The unpredictability trait reminds us of last season’s Ruby (Dove Cameron); calculating, erratic, and distant. Agents of S.H.I.E.L.D. has never had a shortage of flawed geniuses, be it heroes like Leopold Fitz or baddies like Calvin Zabo, Season 6 will have its own flawed genius with PROFESSOR L, a brilliant teacher in his 60s who has a positive outlook on humanity but at the same time is disgruntled, bitter, and a mess of a person outside. PROFESSOR L will be a recurring guest star as well. Lastly, we have an AGENT DAMON, a new SHIELD soldier who is described as being handsome, likable, cool, and funny, but unlike the rest of the characters in this breakdown, and like most SHIELD agents that appear on the show, AGENT DAMON is only slated to appear for one episode. The team must race against the clock when one of them is kidnapped, and Onira-Tech is at risk of being destroyed. Sarah Shahi, Dennis Haysbert, Sendhil Ramamurthy, Kathryn Morris and Jessica Lu also star. We’re going to see our women really step up. And we’re gonna show a lot of stories about leadership with Maggie, with Michonne, with Carol. And they’re gonna go toe to toe with each other and with our men. We’ll see some really complex relationship work. And I’m so proud of the work that our women are doing on the show, and I’m really excited for our audience to see it because they’re having so much fun with each other. They’re just killing it. Elsewhere, set photos of the actor have already leaked online. Nora Allen suits up in another set photo from Suffering Sappho. Recent set footage also shows Barry going up against a new, masked villain he’s forced to attack from all angles at once. Also interesting to note? He’s wearing his original, season one version of the Flash suit. The official logo of Iron Fist’s second season teases the coming of Steel Serpent. TV Insider has a new poster from Comic-Con. The Riverdale kids head to Comic-Con in a new trailer from the CW.